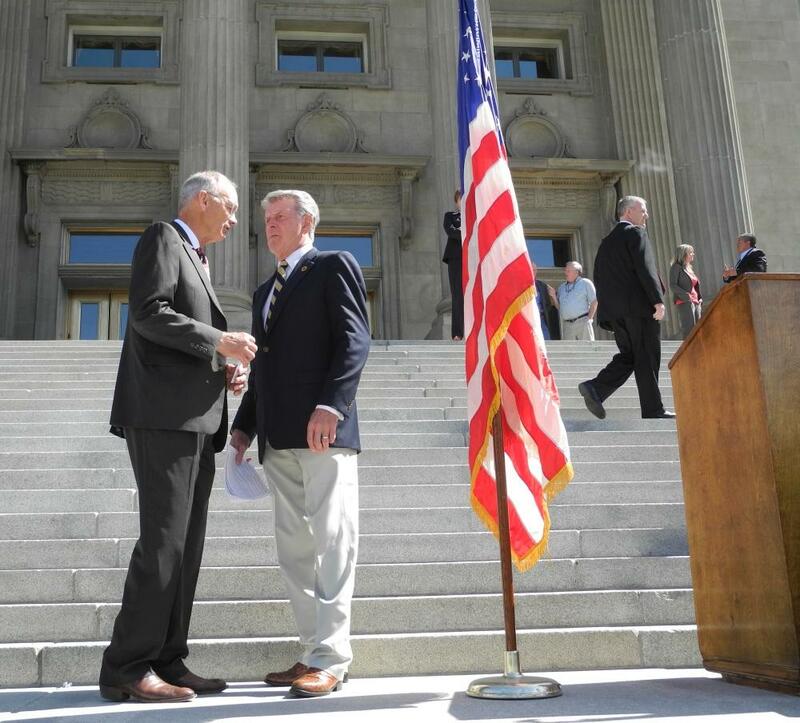 Barry Peterson (left) talks with Gov. Otter at the GOP's May 21 unity rally. Idaho's Republican Party infighting may be solved in court. The leader of Idaho's Republican Party has filed a lawsuit against two members of his own party who called an Aug. 2 meeting of the GOP Central Committee after the group left its state convention without voting on a platform or new leaders. Chairman Barry Peterson has called for an Aug. 9 meeting. Peterson says a lawsuit was necessary because Gov. C.L. "Butch" Otter hasn't responded to requests to resolve the squabble. "With no response from the governor, this action is necessary to uphold the integrity of the Party and the Party Rules," Peterson writes in a press release. Peterson's lawsuit, filed in Twin Falls' District Court, is against Mike Mathews and Cindy Siddoway. The two called a competing special meeting of the GOP, challenging Peterson's authority. Peterson alleges Mathews and Siddoway "illegally issued a call" for that gathering. The Idaho Statesman reports Siddoway was just one of 20 who called for the meeting. "Contrary to some opinions, this dispute is not because I wish to remain chairman," Peterson writes in his press release. "The objective is to work with and respect the Rules of the Party. With the support of the governor, we can find an answer." Six other members of Idaho's Republican Party joined Peterson in filing the suit: LeeAnn Callear, Vicky Purdy, Bryan Smith, Todd Hatfield, Marla Lawson and John Cross. The Republican National Committee has said Peterson's chairmanship is no longer legally valid because it wasn't voted on during June's convention. Gov. Otter's campaign manager Jayson Ronk didn't immediately respond to a request for comment. Idaho's GOP congressional leaders say state party leaders should meet Aug. 2 to determine who's in charge and achieve unity. GOP Sen. Jim Risch and Rep. Mike Simpson issued a joint statement Tuesday saying that they that agree with Gov. C.L. "Butch" Otter that members should respect the date members have chosen to scrutinize their party leaders' qualifications. Their announcement comes after weeks of division between far-right conservatives and establishment Republicans fighting over when the state central committee should meet this summer. The Idaho Republican Party infighting that bogged down the state convention 10 days ago, continues to spill over into the summer as groups have now called two separate meetings to address the ongoing issue of party leadership.